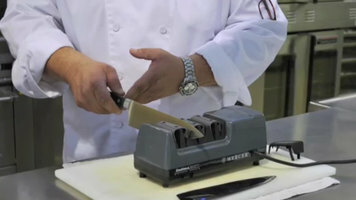 Place the blade of the knife on the flat surface with the edge facing away from your body. Flip the knife and wipe the other side of the blade as well. Dip the knife in the solution and then take it out. Using a cloth soaked in the hot water solution, scrub the blade of the knife. Do it very lightly to prevent scratches. After you have removed visible dirt from the blade of your knife, clean the handle with soapy water. Rinse the knife thoroughly under running water. Dry the knife by using a clean dishtowel. Wash kitchen knives immediately after using them so that the food does not dry on their blades. It is never accepted to place your knife in a drawer without a plastic guard. Make sure that knives lying on flat surfaces are never covered with towels or napkins. 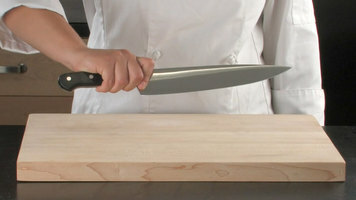 After handling a knife, lay it down in a clear area with the blade and point away from the body and away from the edge of the table or cutting area. 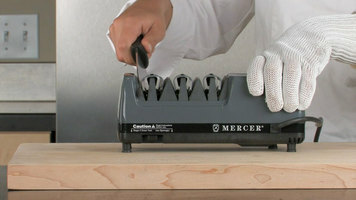 A knife guard is a rigged plastic sleeve that fully encloses the blade. A glass knife block sits on the counter offering convenient access when working and when safely putting knives away. A magnetic bar is a wall mounted magnetic bar design to hold knives firmly in place.